While the American Revolution seemed on the verge of defeat on December 25, 1776, George Washington had assessed the weaknesses and strengths of his situation, and while steadfastly focusing on ultimate victory, reacted to the complex situation and developments over the next ten days to turn the psychological, if not the strictly military, situation completely around. On December 25, 1776 the American Revolution seemed all but defeated just six months after the Declaration of Independence had been adopted. General George Washington’s army had suffered a series of defeats in New York, retreated under British pressure across New Jersey, and then crossed the Delaware River to temporary sanctuary in Pennsylvania. This left the British army in a string of winter cantonments across the middle of New Jersey, the New Jersey state government in total disarray, and the Continental Congress fleeing Philadelphia, fearfully perceived to be the next British target. Loyalists in New Jersey felt empowered and Patriots felt abandoned. Washington needed not only a battlefield victory, but also to reestablish Patriot control in New Jersey. 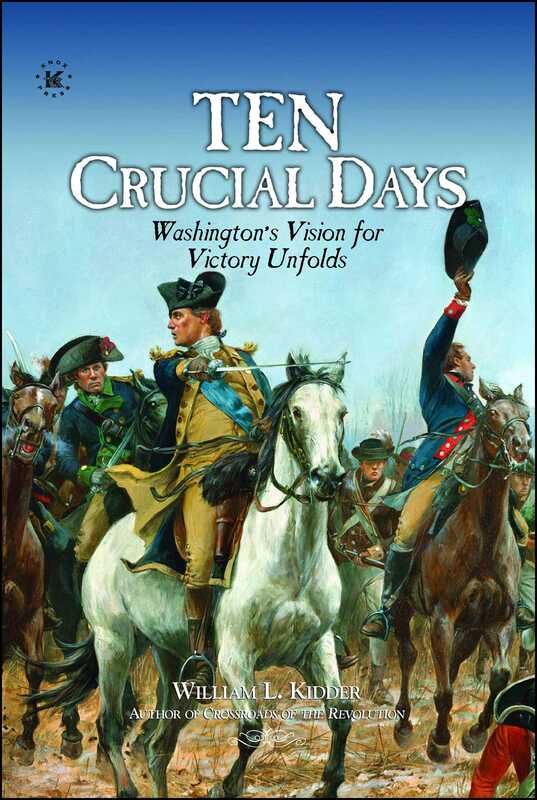 The story of these ten crucial days is one that displays Washington’s military and interpersonal abilities along with his personal determination and bravery to keep the Revolution alive through restoring the psychological confidence of the Patriots, while reducing that of his British political and military opponents. Throughout these ten days, Washington’s efforts faced constantly changing situations, requiring modifications or completely new plans that fortunately often benefitted from elements of luck, such as the weather or British decisions, which he could not control. Join the winter patriots who marched with Washington, fought, and died in frigid temperatures during those “times that tried men’s souls”. Through meticulous primary source research and masterful storytelling, author William L. Kidder corrects the record and presents what we now know about how Washington exploited his enemy’s hubris by leading his upstart army in daring maneuvers that humiliated His Majesty’s forces in just ten short days that changed the course of history. "TEN CRUCIAL DAYS represents the very best kind of immersive history. Readers will feel like they were there with those British and American soldiers who fought and survived or died during the pivotal Trenton to Princeton campaign of late 1776, early 1777. Many huzzahs to author William L. Kidder for producing this thoroughly researched, easy to read volume focusing on the epic events that breathed new life into the faltering cause of liberty. Highly recommended . . . Deserves a wide readership". --James Kirby Martin, author of the awarding winning BENEDICT ARNOLD, REVOLUTIONARY HERO: An American Warrior Reconsidered. “Larry Kidder's TEN CRUCIAL DAYS takes you step by step across the wintery landscape of southern New Jersey. Based on extensive research in primary sources drawn from all sides of the conflict, Kidder introduces the reader to the deeply personal experiences of officers and common soldiers alike during what pamphleteer Thomas Paine called in December of 1776, "the times that try men's souls” - Bob Selig, Historical Consultant, Project Historian, Washington Rochambeau Revolutionary Route National Historic Trail.